Never Let Me Go begins by looking at the life of Kathy, a thirty-one-year-old carer, who is about to become a donor herself. As a “carer”, Kathy’s job is to look after the health of “donors” until they mysteriously die or “complete”. While caring for one of her last patients, Kathy tells the story of her childhood and relives her memories with her dearest friends Ruth and Tommy. Ruth is a leader and center of attention, while Tommy is the school’s outcast, and Kathy is the glue keeping the three together. In this alternate universe, scientists in England are cloning human beings and harvesting the clones for their organs. Kathy, Ruth, and Tommy are all clones who attend Hailsham, a boarding school for clones where they are students from ages zero to sixteen. Hailsham is known to be one of the more humane schools for the clones as other, less prestigious schools are rumored to abuse the students. 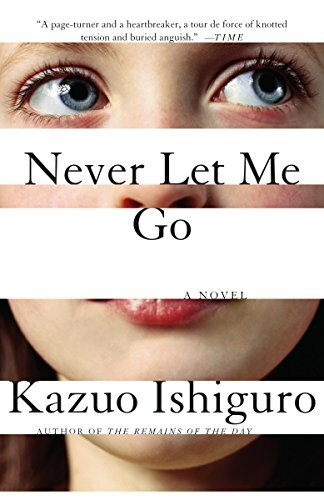 In Never Let Me Go society must decide if the cruelty of cloning is worth the consequences. Ishiguro’s dystopian world is set in the late 1990s and keeps you on the edge of your seat, eagerly flipping pages. Never Let Me Go is a story that will make you question society and your own morals. Should clones be treated equally to humans? Do clones have emotions? Can they feel pain? Never Let Me Go reveals horrific truths about human nature and the consequences of turning a blind eye to serious issues.